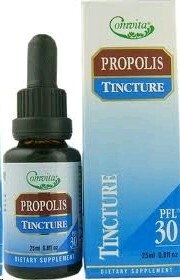 Comvita Propolis Tincture - nature's powerful defence system. Comvita Propolis Tinctures are made from the highest quality propolis in an alcohol base and contains a range of bioflavonoids. Comvita Propolis is created by bees from natural resin produced by trees as part of their defence system. Honeybees collect the resin, mix in beeswax and enzymes, and use it to protect the hive. Propolis sterilises and seals the hive, protecting it from bacterial, viral and fungal infections. Thus Propolis is known as 'nature's best defence'. 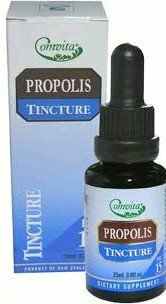 Propolis Tincture is recommended for use on the skin and for immune system support - having beneficial effects on strengthening and supporting the immune system. Internally: Mix 6-10 drops in water and gargle and/or swallow. Externally: Apply directly onto the skin as required. The alcohol evaporates quickly on the skin leaving a covering of propolis. Comvita Propolis Tinctures are made from the highest quality propolis in an alcohol base. It is available in two strenghts: PFL15 and the higher PFL30. The Propolis Flavonoid Level (PFL) measures the amount of health-promoting active ingredients in the propolis product.